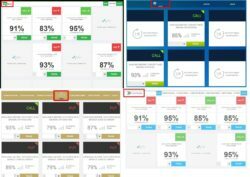 This review shows that Omnia App is a hideous binary options scam. It is presented by Matthew Hammersmith. Hammersmith claims to be the CEO of Omnia Investments – a company that created the Omina trading software for binary options. 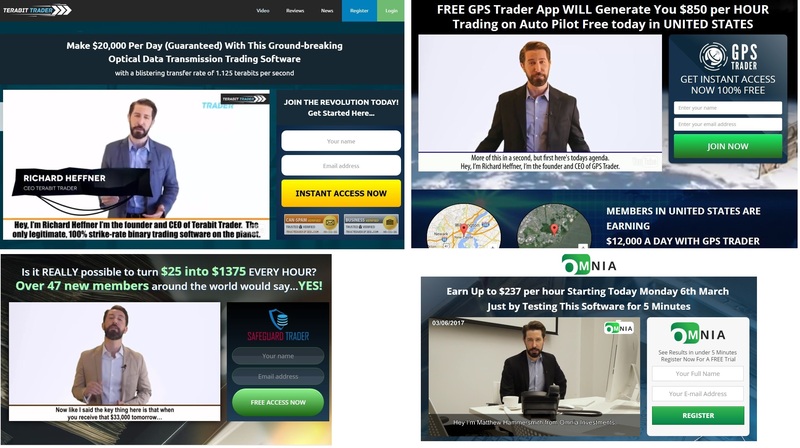 This trading software works on autopilot and allegedly can earn you $237 per hour. 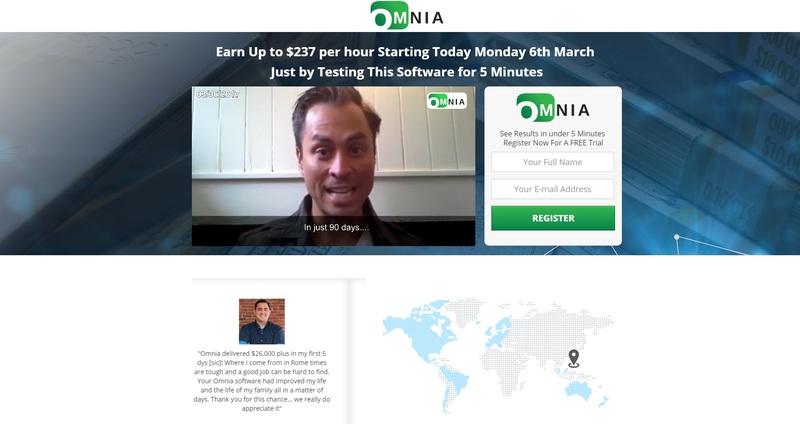 The truth is that Omnia is a scam that abuses binary options. It will push you to deposit money and then it will lose your deposit. Let’s see the proofs. Hammersmith is not a real person with a real company. It is a fictitious person and his role is played by an actor and known scammer. This guy played the main role in several scams under different names, like Richard Heffner in GPS trader or Safeguard Trader. Look at the picture to see it. You can also check links to our reviews. So because Hammersmith is a known liar, you cannot trust him and you can be sure that Omnia is a scam. Because Hammersmith is an actor, all the other people you can see in the video endorsing Omnia are of course actors too. They have never made a single cent with this program, they just provided fake testimonials for money. And static testimonials on the Omnia webpage are fake too. Fictitious stories coupled with some random photos from a website generating random fictitious users. Look at the picture to see the proof. And finally we have the Omnia App that is supposed to trade binary options with your money. It is a well-known scam software used by scammers only. 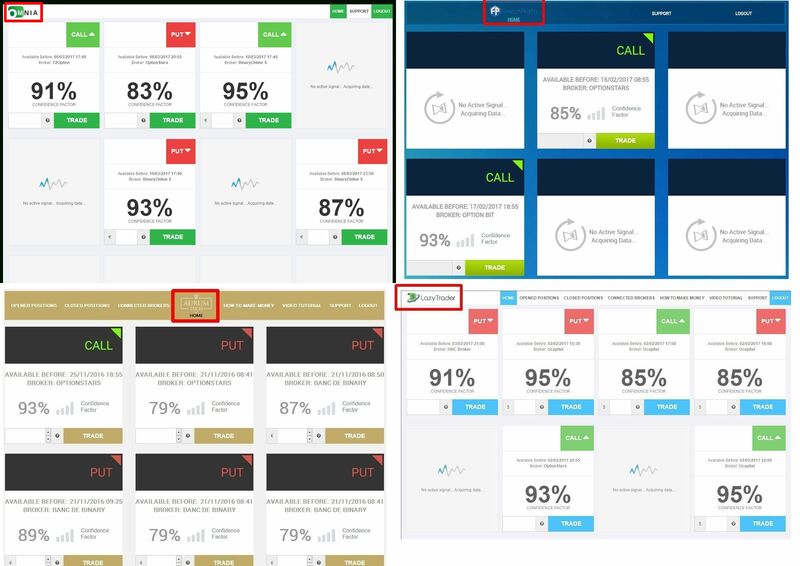 Look at the picture to see some examples of other binary options scams that use this exact same app, like Lazy Trader, Fintech Profits and Aurum Tech. We know from real users of this software that it is losing money in real trading. If you wonder why all this, then we have simple answer. People who run Omnia are affiliated with a certain broker that is paying them for referring new depositors. So this exactly what they do, they are referring new depositing clients to their partner broker. The big problem is that they are using lies to achieve that, they promise you unreal things and in reality they will push you to deposit and lose money with their software. Omnia is an obvious scam that will force you to deposit and then it will lose your money. Stay away from it! On the demo you can learn what you need to make profits. Until then do not trade with real money! WARNING, Raptor Robot is a SCAM!